Mumbai: Produced by Sanjay Routray’s Matchbox Pictures, Andhadhun starring Ayushmann Khurrana, Tabu and Radhika Apte among others, has earned more than a whopping Rs. 200 crores in this overseas market, in just 13 days and is running to packed houses there. It is now in the top 10 list of all time non-Hollywood, non-Chinese films in this market. Industry Trade observers are of the view that this film may well cross the 300 cr mark in this market in the coming days proving that strong content resonates with audiences cutting across language and cultural boundaries. The film also got a standing ovation as the opening film at the prestigious Indian Film Festival of Los Angeles (IFFLA) on Thursday night in the presence of the leading lady Tabu, director Sriram Raghavan and producer Sanjay Routray. Earlier last year Andhadhun emerged as a runaway success on Indian Box office winning high critical acclaim and big audience applause with many rating it as the Best film of 2018. This genre defining, gripping thriller with unpredictable twists and turns and a climax that blew everyone’s mind, ran for more than 75 days in Indian theatres after its release. Andhadhun has been winning top honours at different Award shows, including Filmfare Critics Award for Best Film, Best Actor (Ayushmann Khurrana), Best Editing and Best Screenplay. At Star Screen Awards, it won Best Director for Sriram Raghavan, Best Editing and Best Writing. 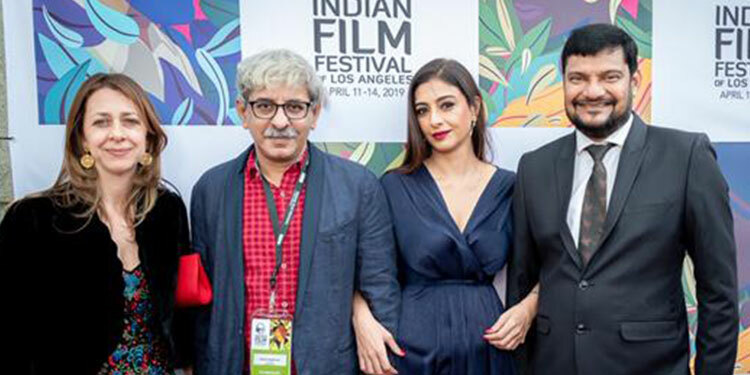 A toast of Indian film awards and a favourite of Indian filmgoers from 2018, Andhadhun has set a new milestone with its massive run in China in 2019 and with the accolades at IFFLA. The film emerged as the highest-rated Indian film of 2018 on IMDb.